Pride of ownership and move in ready on this Palm Harbor nestled in the pine trees. Lot is a premium corner. 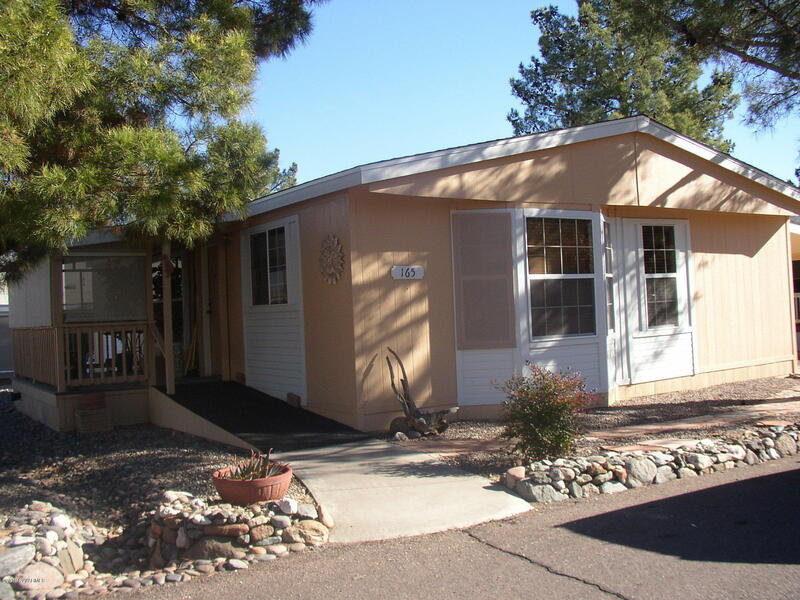 Lot rent is 603.04Has a carport, storage shed and a nice screened in patio w/ sunscreens & a ramp .Has mountain views and is located close to the clubhouse. Enjoy swimming all year long in the indoor pool. Nice kitchen with newer appliaances and all appliances stay. Has laminate floors. A nice master with step in shower and walk in closet. I5s a 3 bedroom and 2 bths. Has air conditioning and gas heat .It is a 55 plus community!! Come check this one out. © Sedona Verde Valley Association of Realtors, Inc., 2019. Information deemed to be reliable but not guaranteed. The data relating to real estate for sale on this website comes in part from the Broker Reciprocity(sm) Program. Real estate listings held by brokerage firms other than arizona adobe group realty are marked with the BR logo and detailed information about them includes the name of the listing brokers. Only residential real estate listings are shown from the IDX database. IDX information is provided exclusively for consumers' personal, non-commercial use and may not be used for any other purpose than to identify prospective properties consumers may be interested in purchasing. Information last updated on 2019-04-22.